A recently released report from the American Academy of Microbiology explains the basics of the human microbiome (the collection of trillions of microbes living in and on the human body) and its role in human health in easy to understand language and illustrations. It's a primer for the general public that addresses questions about this growing area of research. There is also a section on the role of the microbiome in human conditions such as obesity and inflammatory bowel disease, and there are general tips on what can be done to maintain a healthy microbiome. It is well worth reading. Below is part of the answer to the question "How big is the microbiome?" The answer shows that it is amazingly big by all measures. 3) How big is the microbiome? The microbiome is big by almost any measure — number of organisms, total volume, species diversity, and genetic diversity. The microbiome includes approximately 100 trillion bacterial cells. That’s 100,000,000,000,000! You may have heard that there are 10 times more microbial cells than human cells in the human body, but that commonly cited ratio was based on an estimate of 10 trillion cells in the human body. More recent estimates suggest that the human body actually is made up of about 37 trillion human cells. 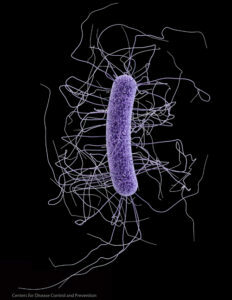 Thus at any given time, the average human body is carrying around 3 times more bacterial cells than human ones. But the microbiome includes more than just bacteria. Remember that it also includes plenty of viruses, fungi, archaea, and single-celled eukaryotes. There is general agreement that viruses outnumber bacterial cells, maybe by as much as 5 to 1. There are thought to be about 10-fold fewer fungal cells than bacteria. All of these numbers are estimates and because the microbiome is a dynamic community, the numbers may change under different circumstances. The microbiome is also pretty big in terms of the space it occupies and its total weight. Even though each individual member is microscopic, those large numbers do add up. Most estimates put the weight of an average human microbiome at about 2.5 pounds. In volume, if consolidated, the microbiome would occupy about 3 pints. Keep in mind though, that the microbiome is not all consolidated in one place, and the density of the various microbial communities varies greatly from body site to body site. Blood and lymphatic fluids are practically sterile, while the intestines and colon contain one of the densest known microbial communities on Earth. What is the secret to that high density in the intestinal tract? Surface area. The inner surfaces of the human intestine and colon are highly convoluted. If you were to flatten out the entire inner surface of the intestine, it would be the size of a tennis court! Dense microbial communities coat that entire surface and also fill the interior spaces of the intestines, resulting in a very dense community. The microbiome is also diverse — a normal microbiome includes around a thousand different species. Thinking back again to your high school biology class, you might recall learning about three basic kinds of bacteria: rods, spheres, and spirals. Certainly bacteriologists developed and used a much more detailed classification system that took into account bacterial physiology and metabolism, but until quite recently, known bacterial diversity was confined to the approximately 5,000 bacterial species that could be grown in the laboratory. Technological advances, especially the capacity to sequence genetic material from environmental samples, have allowed scientists to explore the bacterial world at much greater depth and resolution.